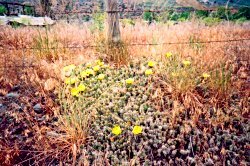 Photo of rabbit brush by P.W. "Make the meadow-larks stop shouting at us!" demanded my friend, as we paused for a moment during our hike. He was joking, of course. Six romantic meadow-larks trilling together aren't exactly a deafening roar. In fact, the inhabitants of B.C. 's interior grasslands are generally quiet and shy. Grasslands are subtle places. They don't reveal their secrets to casual passersby. People looking for the obvious splendour of mountains or forest give a hasty glance, mutter "Nothing there. ", and step on the gas. To them grasslands are just a dull blur of grayish-green sagebrush, bunch grass slopes, and rocky outcrops dotted with a few trees. Those who are genuinely interested, who ride or walk across the land, getting to know it, find complex, interwoven communities, home to such beauty as to make them think that, when it comes to location, cows and cowboys have all the luck. Where else could a ranch family look out their window at breakfast to find three hundred sand-hill cranes discussing the day's migration routes? Ride along the fence line accompanied by darting turquoise bluebirds who've set up housekeeping in nest boxes on the fence posts? Watch ducks resting in small ponds on their yearly journeys? And, how about those meadow-larks? Their nests may be on the ground, but their flute-like calls, the very voices of spring, echo from tree-tops across grassy hillsides. Human wanderers will be watched by wary deer which, if spooked, can leap a fence from a standing position and, if really fortunate, may see a bighorn ram keeping vigil from a cliff top. Lower down most ewes will be grazing while their lambs, gathered into a nursery or "lambasery" are guarded by two or three alert ewes. The intricate family life on the grasslands deserves respect. Occasionally a black bear will grumble along turning over rocks in its quest for beetles or grubbing up plants for their tasty roots. Usually bears and cows pay no obvious attention to each other, though they're certainly aware of who's who in the meadows. Snakes? Of course. Bull snakes, garter snakes and rattle-snakes live here. And, the clichés are true; rattle snakes really do want to avoid humans. Grasslands drab and boring? Never. The retreating snow is followed by jaunty yellow bells, and bright banks of buttercups. The nodding onion was food for First Nations people who used its strong odour to distinguish it from the lovely but dangerous death camas. Sagebrush Mariposa lilies on their slender stalks glow like lavender stars amid surrounding grass. Prickly pear cactus are the greatest surprise. For a few days in late May and early June these tough, spiny, plants bloom. 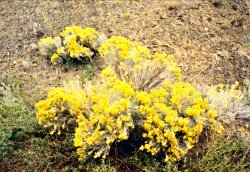 Their gorgeous yellow blossoms cover stony sagebrush slopes, proof that one should never judge by first impressions. The prickly pear cactus flowers so briefly that some people who've worked in the grasslands all their lives have never seen it. 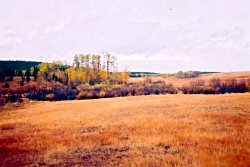 Autumn transforms the grasslands. Rabbit brush flowers, a deep, warm gold. Grasses and shrubs become a painter's delight of bronze, amber, ocher and scarlet. Its gentle beauty tempts people who roam it regularly to keep it a secret. Just theirs and the cows.